Fresh squash from the garden can add nutrients to any dish, whether eaten raw or cooked, and is just as easy to grow as it is to harvest and eat. While some types of squash, such as zucchini, should be grown on the ground level, others can grow on a trellis to increase air circulation and help conserve space in the garden. Summer squash, such as straight, crook neck and patty pan, as well as winter squash like Hubbard, acorn and butternut, all grow well on a trellis. Loosen the soil by digging the ground in your garden bed up to 10 inches deep. Add 3 to 4 inches of garden soil or compost over the bed area. Turn the soil of the bed to mix the garden soil or compost in. Use a hoe to draw up hills or mounds for each squash plant approximately 8 inches deep and 10 inches in diameter. Each mound should be spaced 3 feet apart. Place a trellis over each mound and secure it by pushing the “feet” of the trellis into the soil up to a foot deep. Typically a teepee style trellis made of wood or bamboo with three to four vertical poles should be strong enough to support your squash. Be sure the trellis is at least 5 feet tall above ground with horizontal rungs spaced every foot starting at 6 inches off the ground and going upward. Plant your squash seeds or transplant seedlings into each mound, and center them below your trellis. Water the seeds or seedlings well to moisten the soil, and maintain an evenly moist soil for the first three to four weeks as your plants start to grow. Train the squash to the trellis once your plants reach 5 to 6 inches tall. Use plant ties as needed to help hold the main stem of the plant to the trellis without tying so tight that the vine is choked. Continue to encourage the vine to travel up the trellis as it grows taller. Fertilizer your squash plants with a low-nitrogen 5-10-10 fertilizer every month for the life of the plant until the first frost of fall hits. 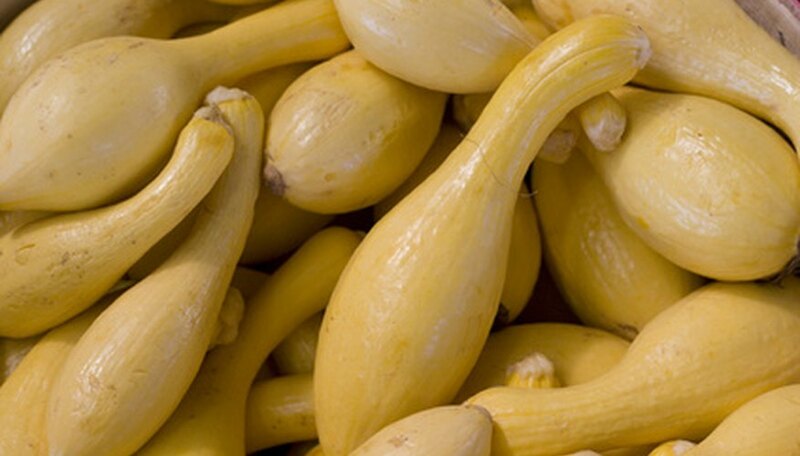 Harvest ripe squash as it matures to keep the plant producing throughout the growing season. On average, you should only need to plant one to two plants per family member to supply more than enough squash for the summer and into fall as well as squash to preserve.